Finding a mains charging point to charge your batteries every other day, seriously restricts your freedom. Imagine all the beautiful, wild places you could stay if, instead of relying on the national grid for your power, you obtained some, or all, of your energy from the natural power of the sun and/or wind? To make a significant contribution to the energy needs of a caravan or motorhome, you probably need a panel of at least 50 watts power output. In summer, a panel of that size should provide enough electricity for lighting, water pump and a radio. If travelling earlier or later in the year when there is less light available, a bigger panel may be necessary. If you are running a fridge or a television, you should consider installing several panels as these appliances can be very power hungry. Framed panels such as the large and small ranges are the most cost-effective panels for a given output. They can either be left unfixed and plugged in when necessary, or mounted permanently on the roof. 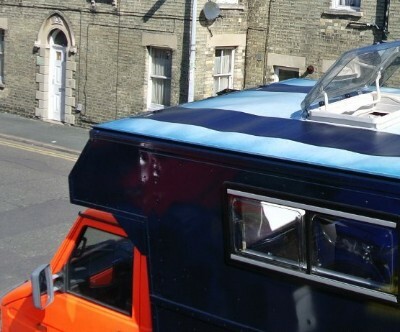 An alternative, sophisticated solution is to fit a flexible adhesive backed solar panel to the roof. These look great, have an extremely low profile, and are very easy to fit. If you have to leave your caravan or motorhome for long periods, you might want to fit a small solar panel to keep the battery topped up, as batteries do tend to self-discharge over time. As a result, discharged batteries soon become sulphated and lose their capacity. The Victron range of rigid-frame solar panels are ideal for this job, and come in 20, 30 and 50 Watt sizes. Alternatively, you can opt for the semi-flexible Unisolar range (see photo), that will gently bend to fit to a caravan roof. They can be mounted either using the 4 grommet holes in the panel corners, or by gluing down the panels. Very small solar panels do not need a solar controller if the capacity of the battery bank (in Ah), is more than 10x the power rating of the panel (in Watts). For example, a 110Ah battery with a 10 Watt panel would be fine, but for an 80Ah battery with the same panel we would recommend fitting a solar controller such as the Landstar PWM controller model. For larger panels, such as the UniSolar models or most of the framed panels, we would always recommend the use of an appropriately rated solar controller. If you are interested in charging both your engine and leisure battery from the same solar panel, this is popular with our dual solar charge controllers, available in selected solar kits. An alternative to solar panels is to use a wind turbine, for example, one of the Rutland models. However, these would need to be taken down whenever you move so are not the 'fit-and-forget' solution that solar panels offer. For static caravans, or if you are likely to stay in one place for a while, they may prove to be a cost effective solution.